I love making sweet treats for family and friends at Christmas time! They’re also handy to use as gifts or to share at end of year Christmas gatherings. 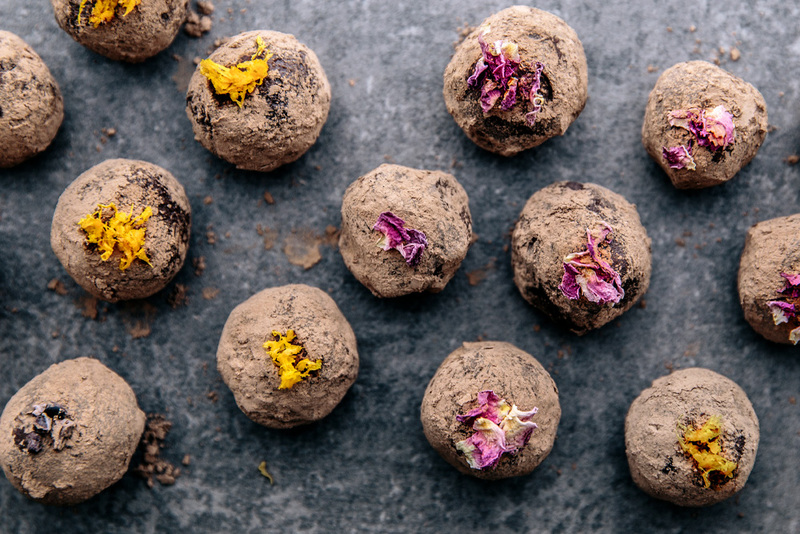 For this truffle recipe I have created three of my favourite flavours; vanilla and rose, rum and raisin and spiced orange, but feel free to get creative with your own favourite flavours. I have popped mine in an airtight container in the freezer ready to go for Christmas day. Easy! What’s your favourite sweet treat to make at Christmas time? Place the very finely chopped chocolate and coconut oil into a medium sized mixing bowl. Heat up the coconut cream in a small saucepan and bring to the boil. Pour the hot coconut cream over the finely chopped chocolate and coconut oil. Push the chocolate down into the hot coconut milk and let it sit for a couple of minutes covered with a large saucepan lid. Remove the lid and stir gently until smooth (be careful not to overmix as you don’t want it separate or curdle). Add the vanilla and flavourings (depending on the flavour you have chosen) and gently fold through the melted chocolate mixture. Place the bowl into the fridge to set for 2-3 hours. Scoop the chocolate mixture into tsp sized balls and roll in cacao powder. Top with either cacao nibs, extra orange zest, rose petals, or leave them as they are. *If the chocolate doesn't completely melt with the hot coconut cream you can place the bowl over hot water in a saucepan and slowly melt the remaining pieces. *The truffles will store in the fridge for about 2 weeks and the freezer for about 4. How amazing is the colour of that pasta? !